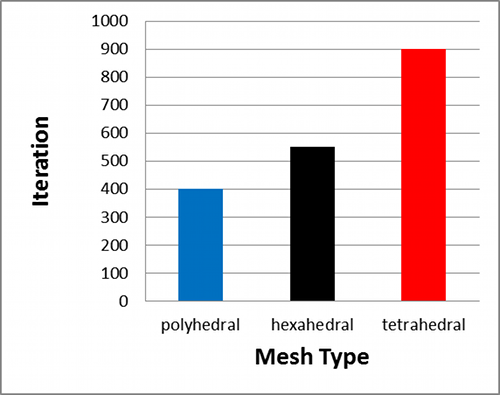 Are you wondering how a polyhedral (dual) mesh compares to the equivalent tetrahedral and hexahedral meshes? Then you're in the right place. This study compares the volume element count, convergence, accuracy, and runtimes of the three different types of meshes for a simple duct. This study focuses on a 3D backward facing step within a duct. The duct geometry was decomposed into 6-faced blocks so it could support a hexahedral mesh as well as the more general tetrahedral and polyhedral meshes. 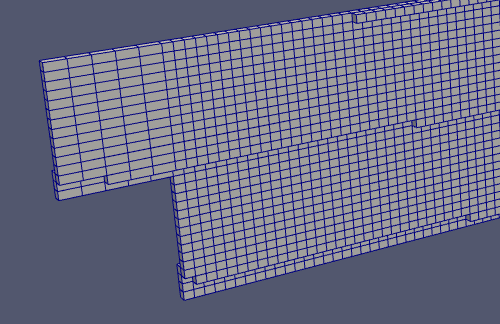 Slices through the meshes revealing volume elements are shown below. 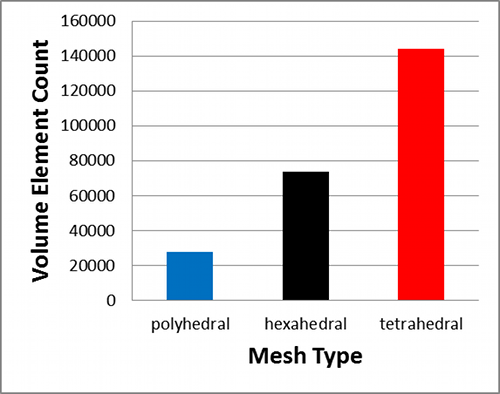 The polyhedral mesh is derived directly from the tetrahedral mesh by forming polygons around each node in the tetrahedral mesh. 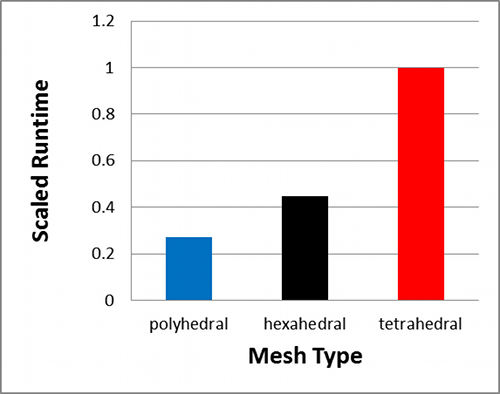 The pressure residual for each mesh type is show below. 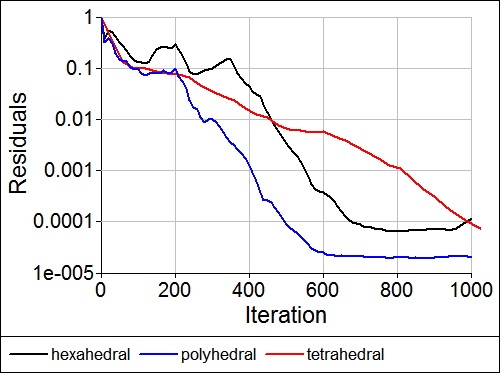 The solution on the polyhedral mesh produced the lowest absolute residual value. 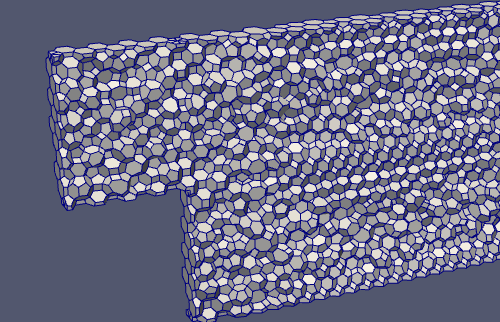 The number of iterations for each mesh type to reach the same level of convergence (1x10-4) for the pressure residual are shown below. 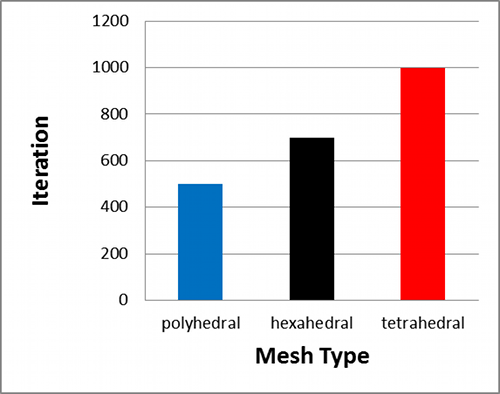 The pressure drop for each mesh type is shown below. While there are minor differences in the converged pressure drop the simulations are in broad agreement on the overall value. 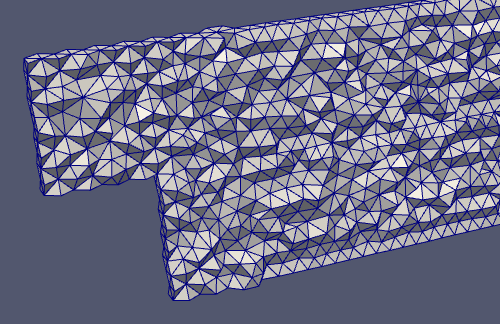 The number of iterations for each mesh type to reach a steady state value for the pressure drop are shown below. Assuming our goal is to reach the steady state pressure drop for each simulation, then the runtimes (scaled against the slowest simulation) are shown below. Submitted by symscape on February 25, 2013 - 20:43. 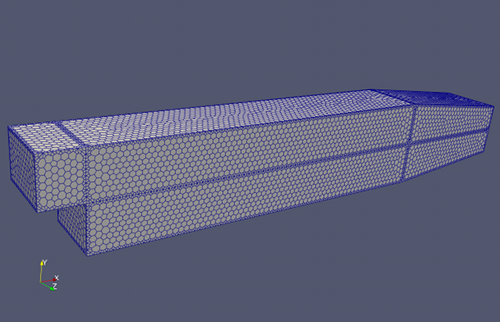 In the next release of Caedium there will be an option to convert tetrahedral meshes to polyhedral meshes. For more details see "Caedium v5 Sneak Peek: Polyhedral Meshes Improve CFD". Submitted by Anonymous (not verified) on May 11, 2015 - 09:01. Please validate the simulation results with experimental data. Residual monitoring does not mean that the result is correct. Submitted by symscape on May 11, 2015 - 13:11. The residual monitor is included for reference, it's not intended to validate the results. The pressure monitor is the indicator that the results are similar for all cases and therefore for that level of accuracy the conclusions hold true. Submitted by Anonymous (not verified) on July 29, 2016 - 02:24. The pressure monitoring is not correct. Experimental data is still needed. 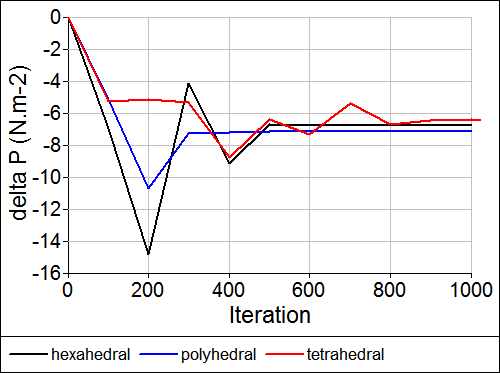 For example, polyhedra and tetra deviate alot from real data in comparison to hexa in swirling flow. Submitted by Clifford Arnold (not verified) on August 1, 2016 - 10:58. What you show is interesting, and targets a questions I have been asking recently. It is my experience that the velocity field converges more slowly than the pressure field, and that finding the converged solution for the velocity field dominates the solution time for benchmarks like the one you have shown. Can you please show the convergence rate for the velocity field for the hex, tet, and polyhedrals meshes? Submitted by symscape on August 1, 2016 - 12:27. "polyhedra and tetra deviate alot from real data in comparison to hexa in swirling flow"
Do you have references you can share? Submitted by symscape on August 1, 2016 - 12:33. "It is my experience that the velocity field converges more slowly than the pressure field"
Typically I see the pressure (field) residual is the slowest to converge for the pressure-correction (segregated) solver used in this study, so that is why I only showed the pressure residual for clarity. Submitted by Anonymous (not verified) on August 8, 2016 - 08:06. Here's the paper title for swirling flow. refer to page 4 for mesh density and page 8 for experimental validation. "TURBULENCE MODEL ANALYSIS OF FLOW INSIDE A HYDROCYCLONE"
it can be seen that tetra performs a lot worse than hexa eventhough the mesh density for the former is 10% higher than the latter as on page 8 (bottom two plots). I can't recall the paper for polyhedra though. I will update you once I get hold of the paper. I am a PhD student dealing with swirling flow btw. any deviation greater than 10% is not acceptable as portrayed by tetra.